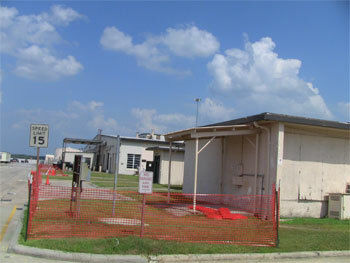 We are currently performing a facility improvement project at the former Metals Refinishing Facility located at Robbins Air Force Base. The scope of work includes the abatement and removal of asbestos containing materials (ACM) and universal wastes as well as the demolition of the Metals Refinishing Facility encompassing approximately 58,000 square feet. Additionally, we are performing the excavation and disposal of contaminated and hazardous soils the removal. The removal of former underground utilities and the installation of new storm sewer, sanitary sewer, and water distribution lines are also being performed. Site restoration activities will conclude the project. It is anticipated that at the conclusion of the project we will have recycled approximately 75% of the former construction materials thereby offsetting some of the project costs while also reducing waste materials requiring disposal. The project duration is anticipated for 180 days at an anticipated project cost of approximately $2,500,000.